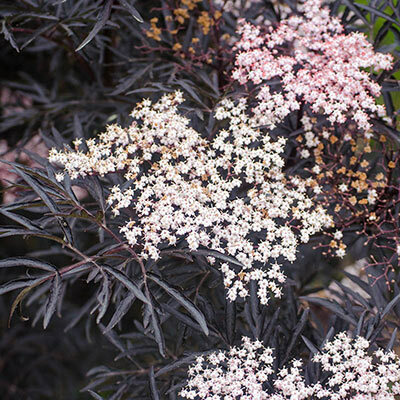 This lovely shrub has it all—beautiful lacy foliage of purple so rich it appears black, huge 10" clusters of pink flowers with a light lemony scent, and a sturdy, easy–to–grow constitution. The flowers attract butterflies in early summer, and glossy dark berries attract over 51 bird species. Prefers a moist, humusy, well–drained soil, but adapts readily to dryer conditions. It takes pruning well, so you can keep it any size you wish, though flowering is more prolific if heavy pruning is only every 3rd year. Deer tend to avoid. Get a head start on growing this shrub—Black Lace Elderberry ships garden–ready in a gallon–sized pot. 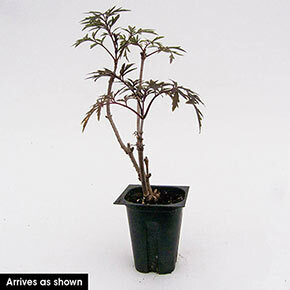 Sambucus nigra 'Eva' PP15575. Flower Form: Flat umbel-like cymes up to 8" across made up of dozens of tiny star-like flowers. Foliage Type: Pinnate, usually 5 leaflets with serrated edges. Young foliage starts out pale green with a hint of purple before turning a dark purple. Pruning: Can spread by suckering, remove to control growth, also prune to almost ground level in late fall to keep in nice shape and size. Late fall or early spring. Soil Requirement: Moist, well drained soil. Additional Information: According to the Humane Society of America, elderberry can be toxic to pets if consumed.